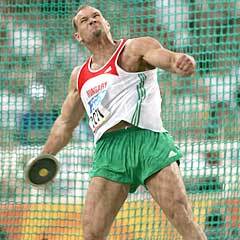 BUDAPEST, Hungary — Hungarian discus thrower Robert Fazekas has tested positive for a banned steroid in his B sample, but he denies doping, his lawyer said. Csaba Czegledy said in a statement late Thursday on Fazekas’ website that the steroid was stanozolol, also present in the A sample. Fazekas was removed from Hungary’s squad for the Olympic Games this month. Czegledy, however, claimed Fazekas hasn’t been notified of the change. “To this day, Robert Fazekas is training and getting ready for the London Olympics,” Czegledy said. In 2004, Fazekas was stripped of his gold medal at the Athens Olympics for a doping offense. Miklos Gyulai, president of the Hungarian Athletics Association, said a hearing in the case would be held on Tuesday by the disciplinary committee of the Hungarian Anti-Doping Group. Gyulai said he supported the athlete’s return to competition upon the end of his two-year ban after Athens. Gyulai said Fazekas would only be able to recover his trust if he submitted as many samples as requested by doping officials during an unannounced 48-hour testing period. “If he produces a negative sample every time … then I’ll apologize,” Gyulai said. After his ban, Fazekas finished eighth at the 2008 Olympics in Beijing and, after undergoing spine surgery, third at the 2010 European Championships in Barcelona. In the past two years, Fazekas has been coached by Adrian Annus, a Hungarian hammer thrower who also was stripped of his gold medal won at the 2004 Athens Games for doping.